Computer Terms / Terminologies Definitions Dictionary PDF Download. Home » Blog » Education » Computer Terms / Terminologies Definitions Dictionary PDF Download. After the successful publication of Computer Abbreviations / Full Forms, here is another attempt to present Computer Terms / Terminologies with Definitions Dictionary in PDF format. We had tried our level’s best to collect and compile all important Computer Terms & Terminologies with the Definitions. All the competitive exam candidates will find these Computer Terms / Terminology compilation very useful and will surely boost their knowledge base too. Computer Terms / Terminologies with Definitions Dictionary. Computer Terms / Terminologies Dictionary with Definitions PDF Download. Computer Terms / Terminologies Starting with “A” with Definitions. Computer Terms with their meaning / definition starting with A. ADDRESS: Identification, represented in the form of a name, label, or number, for recognizing a particular location in storage area. ALPHANUMERIC: It is a character set which contains letters, digits, and usually other special characters such as comma, dollar sign, plus sign, etc. ALU: Arithmetic / Logic Unit is the component of the CPU that performs both the arithmetic and the logical operations for the computer. ANALOG COMPUTER: A Computer that operates on data which is in the form continuous variable physical quantities such as electrical current length, mass, temperature or pressure. APPLICATION: A program that performs a function directly for a user. APPLICATION PROGRAM: Software designed for a specific purpose such as pay calculation, processing of examination results, stores accounting and inventory control, etc. ARTIFICIAL INTELLIGENCE (AI): A branch of computer that deals with computers that possess reasoning, learning and thinking capabilities that resemble those of human beings. ASSEMBLY LANGUAGE: It is a low-level programming language in which mnemonics are used to code operations and alphanumeric symbols are used for addresses. AVI: Audio Video Interleave is the standard audio / video format for Microsoft Windows. AVI files, which end with an avi extension, require a special player. Computer Terms / Terminologies Starting with “B” with Definitions. Computer Terms with their meaning / definition starting with B.
BINARY: A number system using two unique digits. Because of a computer’s electrical nature, all operations are performed using a representation of an open or closed circuit (0 for off, and 1 for on). Therefore, computers use the binary system when calculating operations. BIOS: Basic Input / Output System. The program stored in a ROM chip in the computer that provides the computer with basic code to control the computer’s hardware and perform diagnostics on it. The BIOS prepares the computer to load the operating system. BOOLEAN: A form of algebra where all values are reduces to “true” or “false”. Boolean logic is used with computers due to its similarities with the binary numbering system. BOOT: Short Term of BootStrap. The term boot is generally used to describe the initial loading of an operating system or of some other program into a computer. BRIDGE: A device that supports LAN-to-LAN communications. Bridges may be equipped to provide frame relay support to the LAN devices they serve. They also handle traffic between two similar OR different LANs. BROADBAND SYSTEM: A network system in which several analog signals share the same physical network channel. BUFFER: A strong area or a device where data are temporarily stored. BUG: An error in a computer program. BUS TOPOLOGY: A network geometric arrangement in which a single connecting line is shared by a number of nodes. BYTE: A byte is a unit of measure used to describe an amount of data. One byte consists of eight bits of data. Also se Megabyte, Gigabyte, Bit and File. Computer Terms / Terminologies Starting with “C” with Definitions. Computer Terms with their meaning / definition starting with C.
CABLE: The media that connects electrical components. Cable consists of a group of mutually insulated conductors usually bound or sheathed together and carrying an electrical or other type of signal. CACHE: The storage of instructions or data for future use. CD-ROM: Compact Disk Read Only Memory is a type of optical disk capable of storing up to one gigabyte of data. Also see Byte, Megabyte, and Gigabyte. CLIENT / SERVER: The relationship between computers on a network where the “client” computer uses the resource on a “server” computer. COLD BOOT: Powering a computer up from the off position. COMPILER: It is a system software package which converts a high level language program into a machine language. CONTROL UNIT: The component of the CPU that instructs the rest of the computer system on how to follow a program’s instructions. It directs the movement of data to and from processor memory, holds data and instructions in the ALU, and directs control signals between the CPU and external devices. CPU (CENTRAL PROCESSING UNIT): The control unit and the arithmetic logic unit of a computer system are jointly known as the CPU. All calculations and comparisons are made inside the CPU and the CPU is also responsible for activating and controlling the operation of th other units of a computer system. You May Like: Computer Related Solved MCQs / True False Question Papers. Computer Terms / Terminologies Starting with “D” with Definitions. Computer Terms with their meaning / definition starting with D.
DATA: A collection of facts in raw form that become information after prop organisation or processing. DECIMAL: A number system based on the number “10”. This number system is use on an everyday basis. DEFAULT: A value or setting that is automatically applied by a device or program. DESKTOP: The metaphor used to portray file systems. A desktop consists pictures, called icons, which show files, folders and any resource available to a user in a GUI operating system. DESKTOP PUBLISHING PACKAGE (DTP): It is software which combines computer and graphics manipulating capabilities to allow users to format charts and picture with text and headlines. DIAGNOSTIC: Serving to identify the cause of a problem, as in diagnostic software that will find out what problem a computer may be having. DIGITAL: A system that is based on events or data that is not continuous, such as a binary system. DIGITIZE: To convert data to digital form. DIRECTORY: A type of file that organizes other files in a hierarchical structure. DNS: Domain Name System is an Internet Service that converts names to addresses. DOMAIN: A logical group of computers and electronic devices with a common set rules and procedures administered as a unit. DOS: Disk Operating System is a 16-bit command-line interface operating system that does not support multiple users or multi-tasking. DOT MATRIX: A type of printer that produces characters and illustrations by striking pins against an ink ribbon and print media to print closely spaced dots in certain configuration, much like a typewriter. DRAM: Dynamic Random Access Memory is a type of RAM that only holds its data if it is continuously accessed by special logic called a refresh circuit. DVD-ROM: Digital Versatile Disk Read Only Memory is an optical storage media capable of holding from 4.7 GBs to 17 GBs with faster access and transfer rates than CD-ROMs. Computer Terms / Terminologies Starting with “E” with Definitions. Computer Terms with their meaning / definition starting with E.
EEPROM: ELectrically Erasable Programmable Read Only Memory is a special type of PROM that can be erased by exposure to an electrical charge. EPROM: Erasable Programmable Read Only Memory is a special type of memory that can be erased by exposure to ultraviolet light. ETHERNET: A LAN protocol developed in 1976 by Xerox Corporation in cooperation with DEC and Intel. Ethernet uses a bus or star topology and supports data tranfer rates of 10 Mbps. Computer Terms / Terminologies Starting with “F” with Definitions. Computer Terms with their meaning / definition starting with F.
FAT: File Allocation Table is used by the operating system to store information about where files are stored on a disk. The File Allocation Table is much like the table, of contents in a book. FILE TRANSFER PROTOCOL (FTP): The protocol used by the Internet community to send files. FILE: A collection of related record. FLIP-FLOP: A sequential electronic circuit which can be placed in one out of two stable states. Each state may be used to represent a binary digit 1, or 0. FLOPPY DISK: A portable, removable magnetic disk used to store data using a floppy disk drive. Also see Floppy Disk Drive. FLOW CHART: A pictorial representation that uses pre-defined symbols to describe either the logic of a computer program (program flowchart) or the data flow and processing steps of a system (i.e. system flow chart). FOLDER: An object is a graphical user interface capable of storing multiple files and and other folders. FONT: The combination of typeface and other qualities such as size, pitch and spacing, that comprise a set of characters. Computer Terms / Terminologies Starting with “G” with Definitions. Computer Terms with their meaning / definition starting with G.
GIGABYTE (GB): One thousand Megabytes. GIGAHERTZ (GHZ): One billion (1,000,000,000) cycles per second. This is a common measurement of the speed of a processing chip. GUI: Graphical User Interface is software that uses a computer’s graphics ability to organize and display resources and objects making it easier to use and eliminating the need for a command-line interface. Computer Terms / Terminologies Starting with “H” with Definitions. Computer Terms with their meaning / definition starting with H.
HARD COPY: Printed output from a computer device in a human readable form. HARD DISK DRIVE (HDD): The device that stores and retrieves data from hard disks. HARDWARE: The physical electronic components that make up a computer system. HEADER: In Word processing and printing one or more identifying lines printed at the top of page. HEXADECIMAL: The base-16 number system. This system can represent a byte as two consecutive hexadecimal digits. HUB: A network device where the information flow is accumulated and then distributed to various groups and users. It can be used between users on the same LAN and users on different LANs. HYPERLINK: An item in an electronic document that links to another object such as a position in a document or a different document. HYPERTEXT TRANSFER PROTOCOL (HTTP): The protocol of the World Wide Web. This protocol provides standards by which messages are formatted and sent. Computer Terms / Terminologies Starting with “I” with Definitions. Computer Terms with their meaning / definition starting with I.
I/O: Input / Output describes any operation, program, or device that transfers data to or from a computer. Typically I/O devices are printers, hard disks, keyboard and mice. INTERNET: The decentralized global network that connects millions of computers worldwide. INTERPRETER: A language processor that translates a statement of a high-level language and immediately executes it before translating the next source language statement. It is the most common language processor for BASIC. IP ADDRESS: A numerical identifier for an electronic device on a network utilizing the TCP/IP protocol in the form of a 32-bit numeric address written as four numbers separated by periods. ISDN: Integrated Service Digital Network is a standard for sending data, voice and video over telephone lines supporting a data transfer rate of 64 Kbps. ISDN service normally provides two lines called. B channels, where one line is used for data and one for voice. It is possible to use both lines for data, achieving transfer rates up to 128 Kbps. ISO: International Organisation for Standardization is an international organisation that s responsible for a wide range of standards, including those relevant to networking. ISO developed the OSI reference model, a popular networking reference model. ISP: Internet Service Provider is a company that provides users with a connection to the Internet. Also see Internet. IT: Information Technology encompasses the subject concerned with all aspects of managing and processing information. Computer Terms / Terminologies Starting with “J” with Definitions. Computer Terms with their meaning / definition starting with J.
Jitter: distortion caused in a digital signal by a shift in timing pulses, can also cause data interpretation errors. Joint Photographic Experts Group (JPEG)): refers to a lossy compression technique to reduce the overall image size of the images. Computer Terms / Terminologies Starting with “K” with Definitions. Computer Terms with their meaning / definition starting with K.
KILOBIT (KB): Approximately 1000 bits (precisely 1024 bits). KILOBITS PER SECOND (KBPS): This is a standard measurement of the amount of data transferred over a network connection. Kbps is a data transfer rate of approximately 1,000 bits per second. You May Like: A to Z Computer Abbreviations / Full Forms PDF Download. Computer Terms / Terminologies Starting with “L” with Definitions. Computer Terms with their meaning / definition starting with L.
LAN: Local Area Network is a network that is confined to a limited geographical area. This can be a room, a floor, a building or even an entire campus. LAPTOP COMPUTER: A self-contained portable computer small enough to use on a person’s lap. LASER PRINTER: It is a very high speed printer which uses a combination of laser-beam and electro-photographic techniques to create printed outputs at speed in excess of 13,000 lines per minute. LED: Light Emitting Diode is a semiconductor device that emits visible light when an electric current passes through it. LIGHT PEN: It is a pen shaped device, which is used as an input device to computers by writing or sketching on the screen of a cathode ray tube. LINE PRINTER: A printer which prints one line at a time. LOW-LEVEL LANGUAGE: Programming languages that normally translate from one source instruction to one object instruction. These languages are machine dependent. Computer Terms / Terminologies Starting with “M” with Definitions. Computer Terms with their meaning / definition starting with M.
MACHINE LANGUAGE: A low-level language which is directly understandable by the computer system. Each model of the computer system has a unique machine language. MACINTOSH: A computer manufactured by Apple Computer Company featuring a GUI, Windows, icons and the use of the mouse to navigate. MAGNETIC TAPE: It is a secondary storage device which uses a long plastic strip coated with a magnetic material as a recording medium. MAGNETIC-INK CHARACTER RECOGNITION (MICR): It is an input device which can read cards and paper documents printed with a special magnetic ink. MAINFRAME: A large and expensive computer capable of supporting hundreds, or even thousands, of users simultaneously. MAN: Metropolitan-Area Network is a network between the LAN and the WAN in size. This is a network that covers roughly the area of a large city or metropolitan area. MEDIA: The various physical environments through which transmission signals pass. MEGABIT (MB): Approximately 1 million (actually 1,048,576) bits. MEGABYTE (MB): Approximately 1 million (actually 1,048,576) bytes. MEMORY: A device or medium that can accept data, hold them, and deliver them on demand at a later time. MICRO COMPUTER: The smallest category of computer fabricated using a microprocessor and other integrated circuits, namely a ROM, RAM and I/O interface chips. MICROPROCESSOR: A chip that contains a CPU. MINICOMPUTER: A multiprocessing system capable of providing resources to between four and 200 users simultaneously. MODEM: A contraction of “modulator-demodulator”, it is a device that converts digital and analog signals. At the source, a modem converts digital signals to a form suitable for transmission over analog communication facilities. At the destination, the analog signals are returned to their digital form. Modems allow data to be transmitted over voice-grade telephone lines. MOTHERBOARD: The main circuit board in a computer. This board connects all of the hardware in the computer together. Also see circuit board, hardware. MULTIPROCESSING: A term used to describe interconnected computer configuration or computers with two or more independent CPUs that have the, ability to simultaneously execute several programs. MULTIPROGRAMMING: The name given to the interleaved execution of two or more different and independent programs by the same computer. MULTI-USER: Two or more users running programs and sharing peripheral devices, such as a printer, at the same time. Computer Terms / Terminologies Starting with “N” with Definitions. Computer Terms with their meaning / definition starting with N.
NANOSECOND: One billionth (10-9) of a second. NETWORK: Two or more computer systems connected together in order to share resources. NETWORK INTERFACE CARD: A chip – based circuit board used to connect the PC to a network or server. The card is activated by loading software on the PC. NON-IMPACT PRINTER: A non-impact printer is a printer that prints without banging a ribbon on to paper such as a thermal, inkjet and laser printer. NON-VOLATILE STORAGE: A storage medium that retains its contents even in the absence of power. NTFS: New Technology File System is a type of file system that provides improved fault tolerance over traditional file system, and also provides file-level security. NUMBER SYSTEMS: Sets of values used to represent quantity. Computer Terms / Terminologies Starting with “O” with Definitions. Computer Terms with their meaning / definition starting with O. OPERATING SYSTEM: The program that performs all of the system tasks and provides an environment in which other programs can be run. OPTICAL CHARACTER READER (OCR): An input device which can read characters directly from an ordinary piece of paper by using a scanning mechanism. These characters are written in a special type font. OSI: Open System Interconnection model is an ISO standard that defines a networking structure for implementing protocols in seven layers to transfer data. Computer Terms / Terminologies Starting with “P” with Definitions. Computer Terms with their meaning / definition starting with P.
PACKET: One piece of data along with a destination address used in a packet switching network. PASSWORD: A code by which a user gains access to a computer system. PDA: Personal Digital Assistant describes a handheld ,multifunction electronics device capable of combining cellular phone service, fax and personal organizer abilities together. Most PDAs use a stylus to enter data, necessitating the use of handwriting recognition technology. PEER TO PEER: In peer to peer communication, both computers perform processing of data at both ends, not just input and output. PERIPHERAL: Any device in a computer system that is not essential to the operation of the computer. PICOSECOND: One trillionth of a second. PIXEL: Picture element is the smallest part of a graphic image. Many pixels close together make up the image on the computer monitor. POP: Post Office Protocol is a protocol used by e-mail clients on a network to retrieve e-mail from the mail servers. Also see Protocol, E-Mail, Client, Server and Network. PORT: An interface on the computer where a device is connected. PRIMARY MEMORY: A section of the CPU which holds program instructions, input data, intermediate results and output information produces during processing. It is also known as primary storage , internal storage and main memory. PRINTER MEMORY: A specialized type of memory that can be installed in a printer that will increase its capabilities. PRINTER: An output device used to produce hard copy of computer output which is readable by human beings. PROGRAM: It is a set of instructions used to direct and control the operations of the computer in order to solve a problem or to perform a particular task. It is also known as routine. PROM: Programmable ROM is a type of ROM that can be programmed using special equipment and can be written to only once. PROMPT: One or more symbols used by the computer to indicate if its ready for data input from a user. PROTOCOL: A set of rules by which computers communicate. A protocol is much like the syntax of a language rather than the language itself. PVC: Polyvinyl Chloride is the material out of which the jacket on non-plenum grade cable is made. Computer Terms / Terminologies Starting with “Q” with Definitions. Computer Terms with their meaning / definition starting with Q.
QBE: “Query By Example” is a feature included with various database applications which provides a user friendly method of running database queries. QUAD-CORE: The processor with four processing cores. QUICKTIME: Multimedia Technology developed by Apple Computers. QWERTY: A standard (Latin alphabet-based) keyboard. The first 6 keys in this keyboard is Q, W, E, R, T and Y and hence called as QWERTY Keyboard. Computer Terms / Terminologies Starting with “R” with Definitions. Computer Terms with their meaning / definition starting with R.
RAM: Random Access Memory is computer memory that can be accessed randomly, that is, any byte of memory can be accessed without touching the preceding byte. RING NETWORK: A computer network in which there is no host computer for controlling other computer and in which all stations are equal. ROM: Read Only Memory is a type of memory prerecorded on a chip that can only be read. This type of memory retains its contents without electricity. ROOT DIRECTORY: The uppermost directory in a file system. Computer Terms / Terminologies Starting with “S” with Definitions. Computer Terms with their meaning / definition starting with S.
SDRAM: Synchronous Dynamic Random Access Memory is a memory type that synchronizes itself with the CPU’s bus to provide faster transfer rates than standard DRAM. SEARCH ENGINE: A type of program that seeks out and indexes documents from the World Wide Web and USENET groups based on specific criteria or “Key Words”. An example is Google. SECURITY: The issues of protecting data from unauthorized use, tampering, or destruction are collectively referred to as security issues. SEGMENT: The fragments of a physical record that are arranged in a hierarchical fashion. SERVER: A computer or device on a network that manages network resources. SOFTCOPY: Computer output which is displayed on the screen. SOFTWARE: Any type of data or instructions that can be stored electronically. SPOOLING: It is a technique used to reduce the speed mismatch between slow speed I/O devices and fast CPU. SPREADSHEET: Software for arranging values with a defined relationship with each other. SQL: Abbreviations of structured query language. It is relational data access language created by IBM. SRAM: Static RAM is a type of RAM that holds its data without being refreshed, for as long as power is supplied to the circuit. STANDARD: An accepted format approved by recognized organisation to define certain aspects of an industry. STAR NETWORK: A network having a central host computer system that is attached to local computers through multiple communication lines. SYSTEM SOFTWARE: A set of one or more programs designed to control the operation of a computer system. Computer Terms / Terminologies Starting with “T” with Definitions. Computer Terms with their meaning / definition starting with T.
TCP/IP: Transmission Control Protocol / Internet Protocol is the suite of communication protocols used to connect hosts on the Internet. TELECOMMUNICATION: Transmission of data between computer system and / or terminals at different locations through telephone facilities. TOPOLOGY: The shape of a communication system such as LAN. TWISTED-PAIR: A type of cabling used for data and voice communication that consists of pairs of copper wires twisted inside an outer jacket. Computer Terms / Terminologies Starting with “U” with Definitions. Computer Terms with their meaning / definition starting with U.
UNIVAC: It is Abbreviation of Universal Automatic computer. It is the first commercially available computer. UNIX: UNIpleXed Information and Computing System is a multi-user, multitasking operating system designed to be used exclusively by programmers. URL: Uniform Resource Locator is the global addressing system for the World Wide Web. The first part of the address indicates what protocol to use, and the second part specify the IP address where the resource is located. USB: Universal Serial Bus is an external bus standard that can connect up to 127 USB devices at transfer rates of up to 180 Mbps. USENET: A worldwide bulletin board system that can be accessed through the Internet. Computer Terms / Terminologies Starting with “V” with Definitions. Computer Terms with their meaning / definition starting with V.
VDU (Video Display Unit): An I/O device which consists of a television tube for presenting output and a keyboard for entering inputs. VGA: Video Graphics Array is a standard graphics display system for computers that uses an analog signal instead of a digital signal. VIRTUAL MEMORY: A method of using disk space so as to make programs believe that the system contains more RAM than is actually available. This is done by using pure segmentation or pure paging or both. VIRUS: A program that is loaded onto a computer without the knowledge of the user and runs unknowingly and typically maliciously. Computer Terms / Terminologies Starting with “W” with Definitions. Computer Terms with their meaning / definition starting with W.
WAN: Wide Area Network is a network made up of interconnected LANs that span wide geographic area by using WAN links, such as telephone lines or satellite technology, to connect computers in different cities, countries or even different continents. WARM BOOT: Restarting a computer that is already turned on without first turning it off. Also see Boot, Cold Boot. WEB BROWSER: Software that is used to display web pages and present audio and video to the user. WEB PAGE: A document written in a language of the World Wide Web. WEB SERVER: A computer that delivers Web pages to computer users on Internet. WEB SITE: A location on the World Wide Web that contains a home page, which is the first document users see when they enter the site. The site might also contain additional documents and files. WIRELESS: The ability of an electronic device to communicate with another device using the atmosphere as its media. Also see Media. WORD PROCESSOR: Software used to perform word processing functions such as writing and editing documents. WORLD WIDE WEB (WWW): a collection of Internet servers that support documents created in a specific format, such as HTML, to be displayed with a Web Browser. 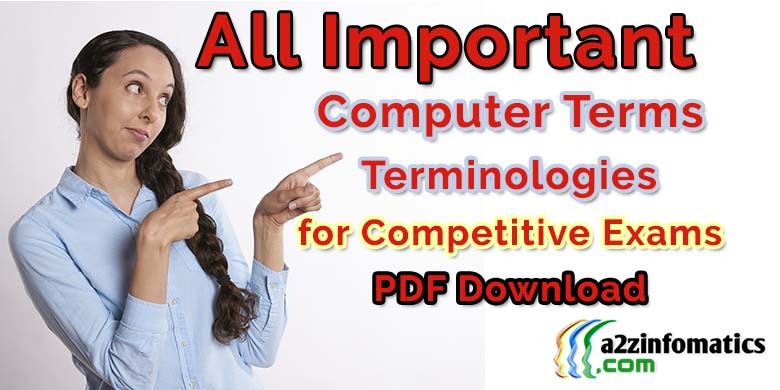 We guess, you had found the “Computer Terms / Terminologies Definitions Dictionary” compilation more than useful, you may get benefited with the Computer Terms / Terminologies Dictionary with Definitions. Feel free to demand more similar content under the comments section below, it’s our pleasure to serve our readers with all their needs.